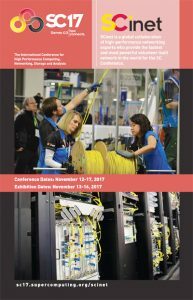 SC17 will host the most powerful and advanced networks in the world – SCinet. Created each year for the conference, SCinet brings to life a very high-capacity network that supports the revolutionary applications and experiments that are a hallmark of the SC conference. SCinet will link the convention center to research and commercial networks around the world. In doing so, SCinet serves as the platform for exhibitors to demonstrate the advanced computing resources of their home institutions and elsewhere by supporting a wide variety of bandwidth-driven applications including supercomputing and cloud computing.